A while back, I had the privilege of visiting the beautiful city of New Orleans, Louisiana. My liver is still recovering from the adventure, but “Noo Aw-lins” has a lot more to offer than cheap drinks. New Orleans, the largest city of Louisiana, located on a Mississippi River bend near the Gulf, the so-named Crescent City offers a mixture of American, African, Caribbean and European architecture, culture and cuisine. Despite its economic and geographical disadvantages, New Orleans is famous for being a city of entertainment and excitement, both exuberant and hedonistic. In August 2005, Hurricane Katrina smashed into the heavily populated city. The city was ruined, however the soul of New Orleans is something that can’t be killed. The heart and soul of New Orleans is the French Quarter that has many shops, elegant art galleries, restaurants, bars, jazz club, so a terribly good nightlife. If you walk through Bourbon Street, the French Quarter’s liveliest and wildest thoroughfare, you’ll hear the rhythmic sounds of jazz, country western, Dixieland and sultry blues permeate the air. On the corner of Rue Bourbon and Rue Bienville, you’ll find the Old Absinthe House bar. The copper-topped wooden bar captivates patrons as they sip their favorite beverages while the sights and sounds of the French Quarter trickle into this comfy bar. Jackson Square, located on the Mississippi River, on Decatur Street, is a must-see place. It is full of street painters, musicians, jugglers, historical buildings and the Moon Walk, providing a breath-taking view of the Mississippi River. New Orleans is also world-famous for its food. Specialties include beignets, square-shaped fried pastries that are sometimes called French doughnuts (served with coffee and chicory “au lait”), Po’boy and Italian Muffaletta sandwiches, Gulf oysters on the half-shell and other seafoods, etouffee, jambalaya, gumbo, other Creole dishes, and the Monday evening favourite of red beans and rice. The featured image for this post is one of the most popular artworks in my fine art photography gallery. 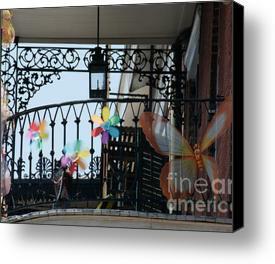 It depicts a beautiful balcony near Bourbon Street in the heart of New Orleans’ oldest neighborhood, the French Quarter, in New Orleans, Louisiana.